Lear’s political focus has been his opposition to the rise of Christian televangelists and the Christian right. In 1981 he left the television industry to focus on political activism and created the left-of-center advocacy group People for the American Way to fight against televangelists. In addition to People For the American Way, Lear has used his estimated $700 million fortune to create and fund a vast network of liberal organizations that support his political agenda. He distributed millions of dollars from his family foundation to left-wing groups such as Planned Parenthood, the Natural Resources Defense Council (NRDC), and the American Civil Liberties Union (ACLU); has given hundreds of thousands of dollars to Democrats;  created a voter registration group that assisted the election of President Barack Obama; and is reportedly a founding member of the liberal mega-donors club, the Democracy Alliance. Norman Milton Lear was born in New Haven, Connecticut on July 27, 1922. He attended Emerson College in Boston for a short time before leaving school in 1942 to serve as a gunner and radio operator in World War II. Lear’s political positions are radically leftist. In 2016, Lear said he was proud to stand with NARAL (formerly the National Abortion Rights Action League) and support abortions, claiming pro-life activists use opposition to abortion to keep women out of positions of power. In 2015, Lear signed a letter with other Jewish Hollywood figures in support of the Obama administration’s nuclear deal with Iran. In 2000 Lear signed on to a letter with Jesse Jackson asking President Clinton to stop the use of the death penalty. In 2002, Lear said that he was pleased a Federal court in California had ruled the Pledge of Allegiance is unconstitutional because of the phrase “one nation under God,” a decision that was later reversed on appeal. Lear has written over 80 posts for the liberal blog HuffPost that take a leftist position on a number of political issues including gun control, healthcare, energy and the environment, and restricting constitutional protections for political freedom of speech. Lear has been an outspoken opponent of President Donald Trump. In a 2016 interview with Salon, Lear called Trump an “absolute f**king fool.” Lear suggested that his famous bigoted character, Archie Bunker of “All in the Family,” would not vote for the then-Republican nominee. Moreover, Lear regards Trump merely as “the middle finger of the American right hand” that voters were using to say “f**k you” to America’s business and political leadership. In 2017, Lear announced he would boycott the Kennedy Center Honors despite being an honoree because he could not accept the White House reception with President Trump. Lear himself however is a major funder of the Democrats and left wing activists. He is a founding member of the secretive left-wing mega-donor club the Democracy Alliance, an exclusive group that includes other noteworthy left-wing mega-donors George Soros, Herb and (the late) Marion Sandler, the AFL-CIO, and the SEIU. In 2004, Lear was noted as one of four Democratic donors, including Soros, the late Peter Lewis, and Hollywood mogul Steven Bing, who combined spent “more than $50 million” to register voters and attempt to defeat President George W. Bush. In addition to funding liberal organizations, Lear has taken a hands-on role in trying to elect Democrats. Beginning in 2004, Lear and his wife launched a “nonpartisan youth voter initiative” known as “Declare Yourself” that claims to have registered well over four million new young voters during in the 2004, 2006, and 2008 elections. In 2008, a coordinator claimed that the group registered twice as many Democrats as Republicans, supposedly handing the election to Democrat Barack Obama over U.S. Sen. John McCain (R-Arizona). Moreover, Lear has given hundreds of thousands of dollars directly to Democratic political candidates, Party committees, and progressive political committees. Conversely he has only given an aggregate total of $3,000 to two Republican candidates. 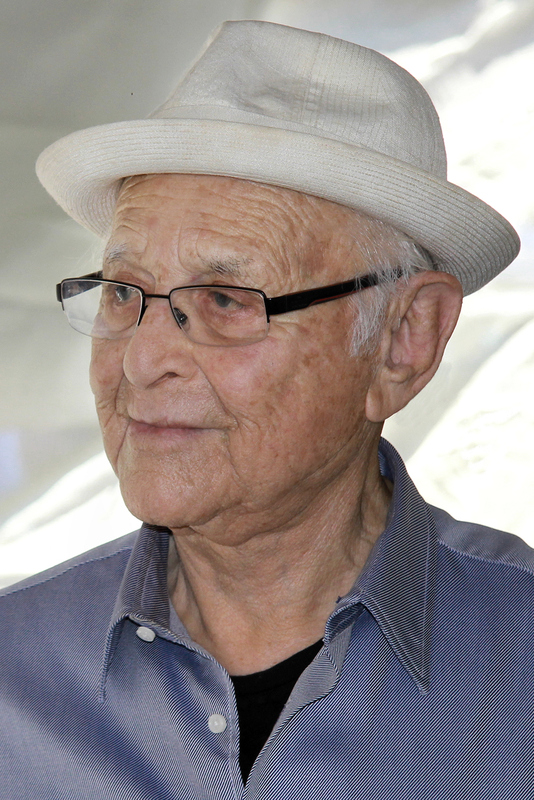 According to Inside Philanthropy, Norman Lear’s net worth is estimated at $700 million, which has allowed him to become one of the leading progressive philanthropists who spends millions of dollars per year through his network of charities that promote left-wing positions on civil liberties, environment, arts, and education. In 1980-81, Lear along with liberal former U.S. Representative Barbara Jordan (D-Texas) and other aligned business interests founded People for the American Way (PFAW) as a means to fight against the “radical and extremist agenda” of conservative televangelists and all of the religious right. Lear created a series of television commercials featuring famous faces (notably champion boxer Muhammad Ali and actress Goldie Hawn) alongside blue-collar Americans that gained notoriety attacking the televangelist preachers for imposing their political views. Building on these commercials, Lear founded PFAW as a means to further expound upon this message. In a 1985 speech entitled “the Threat of the Religious Right,” Lear criticized “ultra-fundamentalist evangelists” including Jerry Falwell and Pat Robertson for their simplistic solutions to complex problems and for proclaiming a monopoly on truth based in their Biblically self-evident moral answers. By 1986, headed by controversial D.C. insider Tony Podesta, PFAW emerged as a preeminent force on the left, with a $5 million annual budget that relied on the media to amplify its message. PFAW’s operations initially were focused on opposing religious-minded censorship and continued federal funding for schools to teach “secular humanism.” PFAW opposed numerous efforts to nominate conservative judges, including helping defeat the nomination of Judge Robert Bork to the U.S. Supreme Court. PFAW also led the battle to secure a constitutional protection for flag-burning. Over the ensuing years, PFAW has partnered with other left wing groups such as the NAACP, ACLU, and the AFL-CIO. Moreover the group has increasingly involved itself in political campaigns. In 1998, PFAW underwrote a national television campaign called “Let’s Move On” to attack Republican critics of President Bill Clinton, and the same year they established the People For The American Way Voters Alliance PAC that since 2002 has given 100% of its more than $400k in campaign contributions to Democrats. In 2006, the newly formed Democracy Alliance approved a grant to PFAW, and the Gill Foundation gave a Democracy Alliance-approved grant of $50,000 to PFAW’s spinoff group, Young People For. Similarly, the People for the American Way Foundation has received support from a number of left-wing philanthropies including the Carnegie Corporation of New York, the Bauman Family Foundation, the Nathan Cummings Foundation, the Open Society Institute (now Open Society Foundations), the Public Welfare Foundation, the Barbra Streisand Foundation, and the Ford Foundation. During the 70s Lear created a number of other controversial shows that touched on social issues such as race, abortion, and divorce. Lear’s shows included “Maude” (1972-78), “Sanford and Son” (1972-77), “The Jeffersons” (1975-85), “Good Times” (1974-79) and “One Day at a Time” (1975-84). “Maude” made headlines when the title character chose to have an abortion in a 1972 episode, two months before the Supreme Court’s Roe v. Wade decision which legalized elective abortion with almost no restrictions nationwide. In 2017, Lear agreed to host a podcast called “All of the Above” to address contemporary pop-culture, politics and social issues featuring the perspectives of left-wing celebrities such as Amy Poehler and Julia Louis-Dreyfus. In 2016, Lear produced the television mini-series “America Divided,” which sought to use eight famous faces to highlight socioeconomic issues with the hope of influencing public policy debates. The series focused on eight different issues, immigration, civil rights, workers’ rights, and the nation’s “equality imbalance.” When pressed on these issues, Lear said, “I’m confident the economic inequality is worse now than it’s ever been.” Further, he proclaimed that the first way to make sure to act on these issues was to make sure Donald Trump didn’t get elected. As part of the America Divided series Lear hosted a segment on affordable housing and he feigned concern about the divide by the ultra-luxury condos in New York compared to the affordable housing conditions. Two months after making these comments, Lear re-listed his Southern California 10-acre, seven bedroom “compound” for sale for $40 million. He also maintained a $10 million condo at the exclusive 15 Central Park in New York. With his wife, Lyn, and Alan and Cindy Horn, in 1989 Norman Lear co-founded the Environmental Media Association (EMA) to mobilize the entertainment industry to become more environmentally responsible. The group counts the Endangered Species Coalition, the Alaska Rainforest Campaign, the Sierra Club and the World Wildlife Fund among its partners. The Environmental Media Association promotes left-of-center environmental ideas through celebrity role modeling, campaign work, year-round programs and our two large-scale annual events. Through this organization, Lear has encouraged Hollywood to insert green themes into films and TV shows. The organization calls this “greening plotlines,” which encourages producers to use “subliminal messaging” in their productions to support environmental prerogatives. This subliminal messaging could take a number of forms from T-shirts with green messages to larger eco-centric plot lines. Lear also funded the Norman Lear Center at the USC Annenberg School for Communication a research and public policy center dedicated to exploring the convergence of entertainment, commerce and society. In an effort similar to the EMA, USC’s Norman Lear Center has within it a federally funded Hollywood Health and Society program that pushes TV producers, writers, and directors incorporate left-wing healthcare policies into their programs. For instance in 2013, the Hollywood Health and Society program received a $500,000 grant from the left-wing California Endowment to push pro-Obamacare information to TV producers, writers, and directors to incorporate into their programs and to create public service announcements to mirror the TV shows’ storylines. From 2009 to 2015, the Hollywood Health and Society program touted that they were responsible for 900 shows incorporating left-wing healthcare storylines into their program.